We hope these stories of medically indicated abortion which were shared with Ending a Wanted Pregnancy by parents who’ve gone through this, will help and comfort you through your time of loss. We have collected stories told by mothers and fathers who have been through the heartbreaking decision to obtain a medically indicated abortion due to a poor prenatal diagnosis of fetal anomaly, or for maternal health reasons. Simply scroll through the list of diagnoses or types of termination to see tagged stories. In addition to the alphabetical list of diagnoses leading to medically indicated abortion below, you may also find it useful to use the “Search” bar. Simply enter keywords such as another diagnosis, a medical procedure, or other situations such as infertility, multiple losses, divorce, single parent, or a religion. If you do not find the diagnosis that led to your decision listed here (or even if you do), please share your story with us by sending it in as text (no attachments please) to info (at) endingawantedpregnancy.com. Your story will help other parents who are going through similar grief now, and in the future. Know that we care about your privacy: You will not be identified in your story unless you specifically request we do so. We are sensitive to the fact that not everyone goes on to have a healthy subsequent pregnancy and a “rainbow” baby after suffering a medically indicated abortion. However, many of us have. Our stories are shared here to offer encouragement and hope to all who are coping with this loss and considering trying again. Regardless of the fetal anomaly, prenatal diagnosis, maternal health issue or type of abortion procedure, the stories of medically indicated abortion told here may help you understand that others have been where you may be now. We’re here to help you find your way through this difficult and misunderstood form of pregnancy loss. While nobody ever really “wants” to have an abortion, facing a medically indicated abortion when you’re carrying a wanted pregnancy is a particularly heartbreaking circumstance. Every story here was sent to us by individual who wanted to reach out to others facing the prenatal nightmare of medically indicated abortion for a wanted pregnancy. They were relieved to find our website and learn that they weren’t the only ones. Discovering that many other parents have made similar decisions when faced with the worst prenatal news possible can be a relief, can be validating, but can be a bit sad too. Nobody wants anyone else to have to go through this, but others have, and it’s nice that we can find each other and support each other through a kind of loss that many people don’t even want to consider could happen to them. As you read our stories, please keep in mind that all were written by real people who’ve been through this. Most are lay people rather than medical professionals. If you’re looking for medical guidance regarding a poor prenatal diagnosis, prognosis, or type of abortion procedure, please consult your doctor. We are here to support each other in the aftermath of a difficult decision and loss. This is not a medical website. Our stories reflect the real world experiences and views of moms and dads who’ve faced one of the most difficult decisions of their lives: the decision to prevent their baby from suffering. Obtaining a medically indicated abortion involves a lot of soul searching, and examining questions such as our reasons for having children, what we want for our children, and what do our other children, our spouses and yes, even we need as we face the terrible news that our pregnancy has gone awry. It also involves practical concerns such as legal restrictions on abortion, insurance coverage and financial burdens, dealing with friends and family who don’t understand, and hard questions such as how to memorialize your baby, or what to do about her remains. For the most accurate information and prognosis of a specific birth defect or genetic condition, please consult with your medical care provider or genetic counselor. Our Poor Prenatal Diagnosis index has links to qualified medical websites which will save you the trouble of seeing upsetting search engine results. 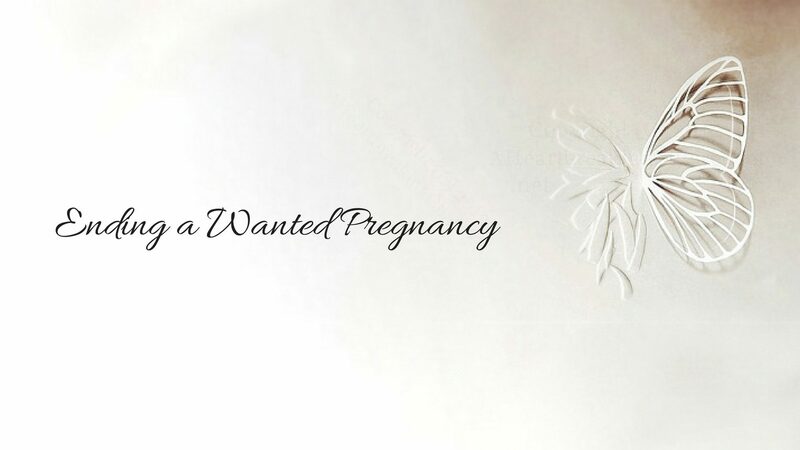 Read more about how and why to share your story with Ending a Wanted Pregnancy. CC0 Public Domain Image courtesy of Pixabay.